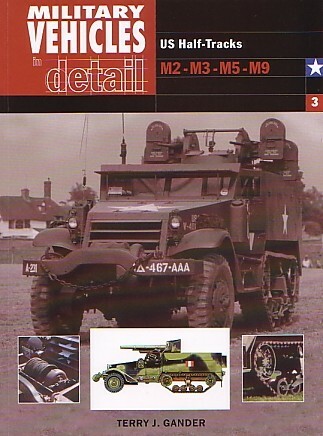 This latest soft cover book in the Military Vehicles in Detail series covers the ubiquitous US half-track. There are 96 pages and these are divided into five chapters. The first chapter deals with the development of the half-track in Russia. The many unsealed roads drove Adolphe Kégresse into investigating this mode of transport and unlike many of his contemporaries, developed a steel reinforced rubber track. He later moved to France where he teamed up with André Citroën. Together they produced a series of vehicles and it wasn’t long before their idea had wide appeal. The US Army was looking around for an alternative to the 4 x 4 approach and soon saw the benefits of the Citroën-Kégresse product. The rest, as they say, is history. Chapter two gives a technical description of the chassis, body, drive and stowage and includes many interesting close-up photos. Speaking of the later, there are more than one hundred black and white photographs, many coming from technical manuals. The reproduction is good and with an average of two photos per page, a lot more detail is seen than is usually the case. The reader must be cautious here as some of the captions are misleading. A section on armament follows before chapter four introduces the reader to the production of the series. Here we find tables for the various types, which contain the quantities produced as well a break down of technical data. Following on from this is the final chapter, which is devoted to the type as a weapons carrier, and also includes both prototype and experimental vehicles. Artwork is also present and Mike Ross presents seven images. Not to be outdone, Nigel Pell chips in with an interesting page depicting the colours of various types of 37mm gun and 81mm mortar shells. The book also contains a series of scale drawings that look decidedly familiar. Terry Gander’s writing style makes for a pleasant read, and his coverage of the US half-tracks is very good. This book provides the reader with a ready introduction into one of the most widely used vehicles of World War 2.